HARRISBURG – January 1, 2019 – State Senator Steven J. Santarsiero (D-10, Bucks) was sworn in for his first term in the State Senate during a ceremony today in the Senate Chamber of the State Capitol in Harrisburg. Sen. Santarsiero was joined by over 100 friends and family for his swearing-in ceremony. Pennsylvania Justice Kevin M. Dougherty administered the oath of office. “I love the 10th District and am honored to have the opportunity to represent my community and the great Commonwealth of Pennsylvania,” Santarsiero said. The Lower Makefield lawmaker will begin his first term in the State Senate after winning the 2018 general election in November. 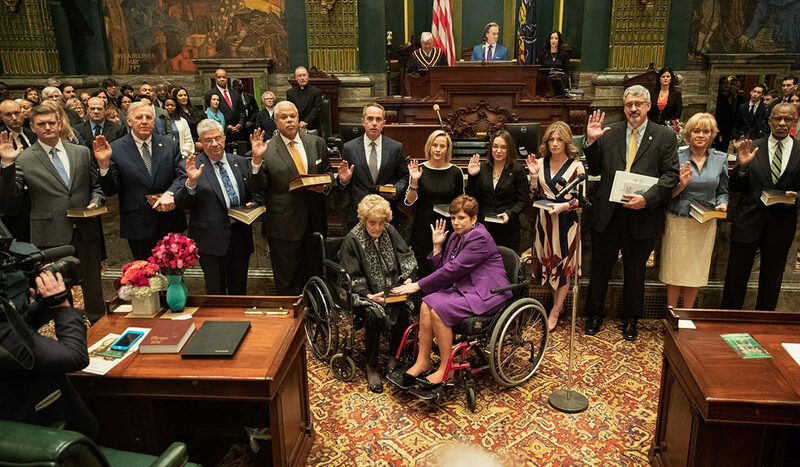 Prior to joining the State Senate, Sen. Santarsiero was a member of the Pennsylvania House of Representatives from 2009 to 2016 and the first Chief Deputy Attorney General for Environmental Protection in Pennsylvania under Attorney General Josh Shapiro from 2017 to 2018. Top priorities for Sen. Santarsiero include fighting for affordable and accessible healthcare, education funding, common sense gun violence prevention, environmental protection, and government reform. During his tenure in the State House of Representatives, Sen. Santarsiero was a reformer, writing the bill that would ultimately be adopted as new House rules on keeping politics and government service separate; refusing perks like per diems and a state car; and not collecting his pay during prolonged budget impasses in 2009 and 2015-2016. Sen. Sanatarsiero was also a leader in education, infrastructure investment, environmental protection, women’s health issues, and gun violence prevention. Sen. Santarsiero will have district offices in Doylestown and Newtown and can be reached via email at SenatorSantarsiero@pasenate.com. Video of the swearing in can be found by clicking here.